In 2017 a spacecraft will plunge through the rings of Saturn and burn up in a fiery denouement in the atmosphere of the gas giant. The probe will have soldiered through its primary mission and two extensions, but its life is forfeit due to another duty: planetary protection. The Cassini-Huygens spacecraft was a joint lander and space probe mission which was launched in 1997 and arrived in the Saturn system in 2004. In 2005 the lander Huygens detached from Cassini and became the first spacecraft to land on Titan, the largest of Saturn’s moons. Diving into the depths of our solar system has taught us that our preconceptions about other celestial bodies can be overturned. The Cassini-Huygens mission to the Saturn system has revealed that there is potential for life where previously not thought possible. The Italian-French astronomer Giovanni Domenico Cassini discovered four of Saturn’s moons and also noticed the stratification of Saturn’s rings. Titan was discovered in 1655 by the Dutch astronomer Christiaan Huygens. Titan has a temperature of approximately -180°C (-292°F) which is far too cold for liquid water to exist on the surface. Every known life form needs liquid water for survival. The atmosphere of Titan is very dense and is primarily composed of nitrogen but also contains methane and other organic compounds. It is thought that the atmosphere of Titan resembles that of primitive Earth. Due to the nitrogen rich atmosphere and the absence of liquid water when the Cassini-Huygens spacecraft left Earth it was thought that the possibility for life on Titan would be extremely remote. Cassini and Huygens analyzed Titan’s surface and relayed a significant amount of data back to Earth. It is now known that liquid composed of ethane, methane, and propane is present on the surface and in abundance in the North Polar Region where it resides in multiple lakes and seas. Cassini also performed several flyby missions over Enceladus, another notable moon of Saturn. From this flyby it was discovered that Enceladus’ internal heat was escaping and therefore it is geologically active today. The presence of a water-rich plume venting from the Enceladus’ South Polar Region was also discovered by the probe. Enceladus also appears to have liquid water under its icy surface and therefore it seems to be a promising place to search for alien life. 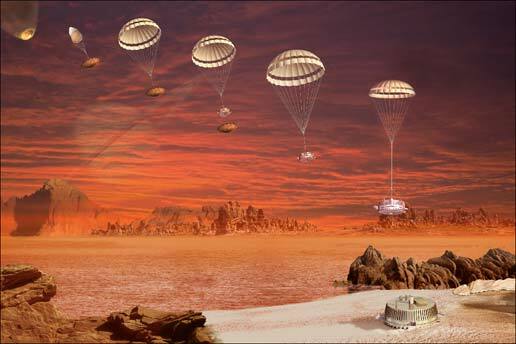 Artist’s concept of Huygens probe descending on Titan (Credits: ESA/C.Carreau). The Cassini-Huygens mission is operated by the National Aeronautics and Space Administration (NASA), the European Space Agency (ESA) and the Italian Space Agency (ASI) with the objective to study Saturn’s rings, atmosphere, and the surfaces of its natural satellites. The Huygens lander adhered to the Category II standard of planetary protection which is used for spacecraft with little chance of Earth contamination compromising investigations. In accordance to this standard the lander was not sterilized. Prior to the Cassini-Huygens mission, Titan was very mysterious due to its dense atmospheric mask. Although it still somewhat remains a mystery, the Huygens lander and fly by investigations performed by Cassini have uncovered some of Titan’s secrets. It has been determined that Titan has a similar weather system to Earth involving methane rather than water. The atmosphere of Titan is approximately 95% nitrogen and 5% methane along with organic compounds. Organic compounds are formed by the destruction of methane by sunlight. It is still not determined how methane is regenerating in the atmosphere if it is being destroyed by sunlight. On Earth the resupply of methane to the atmosphere is created by the processes of life, an example of which is cattle. Dr. Chris McKay of NASA Ames Research Center has hypothesized that some of the regeneration of methane to the atmosphere is occurring due to methanogens, or methane producing microbes. His theory suggests that these microbes are breathing hydrogen rather than oxygen and feeding on organic molecules coming from the upper atmosphere. Although this is not proof of life, it is an interesting interpretation on how life may exist on another celestial body and how much we have to learn about our solar system. The Huygens probe which landed on Titan was not sterilized as the chances of finding life were considered insignificant. From further investigations it is evident that chances for life on Titan are higher than initially thought. Although forward contamination in this case is still considered unlikely, it reinforces the need to ensure we protect extra-terrestrial chances of life. The Cassini space probe (Credits: NASA). 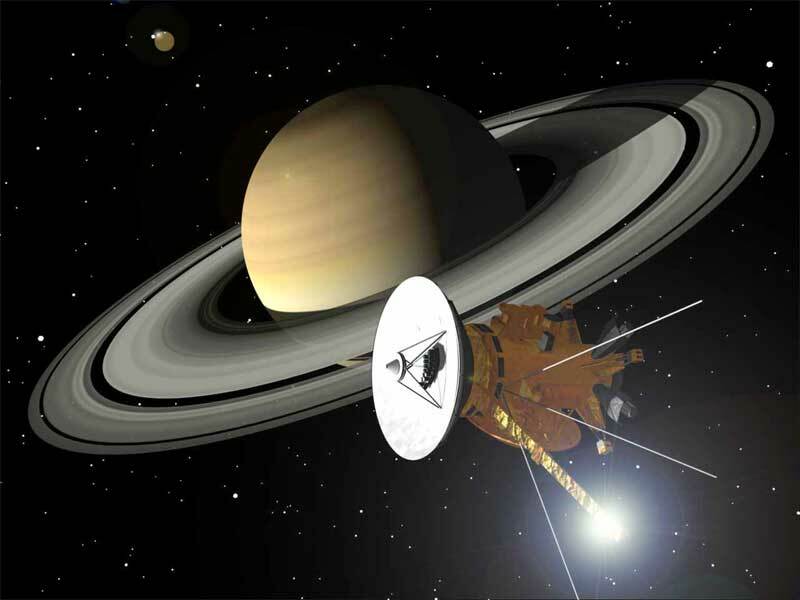 Initially the end of the Cassini mission was scheduled for 2008 but it benefited from two mission extensions: Equinox and “Solstice. The Cassini mission end is now planned for 2017 and is intended to complete a “controlled impact” into the atmosphere of Saturn. This solution has been selected among several options including impacting on an icy satellite and impacting on the main ring. Cassini has already observed the Saturn system for almost 10 years and remains in remarkably good condition. In the next three years, it will continue to orbit Saturn and will also complete additional flybys of Titan and Enceladus. The strategy for end of life of Cassini is the result of scientific study goals and the mitigation of planetary protection issues. Jean-Pierre Lebreton has worked at ESA-ESTEC, in the Netherlands, for 27 years and was the project scientist of the Huygens mission. Lebreton explained that “Cassini will perform 20 orbits around Saturn between the planet and its rings in order to make unique observations of the planet.” Cassini will dive between Saturn and its iconic rings, gathering more data on the planet’s magnetosphere and gravity field. Lebreton also explained that Cassini does not comply with the planetary protection principles. Accordingly, care will be taken to ensure that Cassini does not crash into a body which has a significant chance for hosting life, such as Enceladus. Cassini’s mission scientists decided to impact the probe into the atmosphere of Saturn to ensure biological contamination will not occur. Saturn should not suffer any damage from this impact. Although the possibility that Saturn might host life is unlikely, the spacecraft will not risk even that unlikely scenario; Cassini will disintegrate and be scattered into the giant gaseous planet’s atmosphere, preventing possible contamination from Earth. Featured image: Earth viewed by Cassini from Saturn July 19, 2013 (Credits: NASA). Nice write up, I enjoyed it very much . Indeed i liked the article too… could we humans be responsible for future alien life? Thanks for your comments Wes and Daniel. Many places around the Solar system seem hostile to life. However, there is no evidence that life doesn’t exist elsewhere that on Earth. There is possibility to find evidence of alien life on another celestial body. Some extremophiles are capable to survive to a space travel and could remain dormant for a very long period. Those extremophiles discretely travel on-board of human-made spacecraft sent to explore the Solar system. For example, it is possible that such organisms were carried by a rover on Mars but they don’t have encountered conditions that permit them to metabolize and reproduce yet. So actually, yes. It is possible that humans could be accidentally responsible for alien life. But this is not what we wish. We call that contamination.